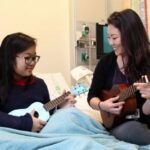 Ukulele Kids Club Hits High Note with Children’s Healthcare of Atlanta | Ukulele Kids Club Inc.
“I’m a board certified and licensed music therapist and work specifically on the floor at the Aflac Cancer and Blood Disorders Center for Children’s Healthcare of Atlanta. Music is such a motivator for all of our kids. It connects them which is one reason why I do ukulele groups. Many of our kids, especially those with sickle cell, will come into the hospital in extreme pain and that’s such a young age to be experiencing that and requiring Morphine and Percocet and Dilaudid; all these really hefty drugs. You know they have to be in a lot of pain, so usually with my blood disorder kids, I’ll introduce the concept of coming to the ukulele group and they’ll say, “Oh, I’m not so sure, I’m not really feeling great,” but if I can get them out of bed and to the group, they’ll end up smiling and laughing and really interested in what each other are doing. 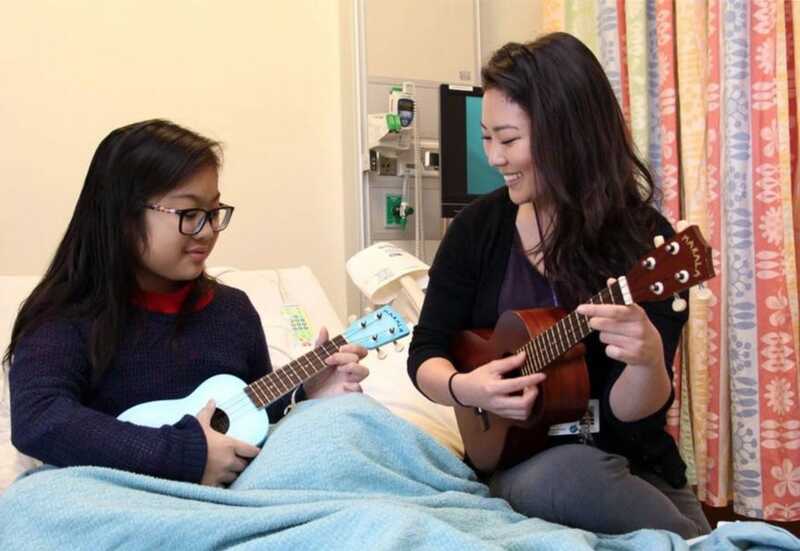 After teens have attended the ukulele group I give them the option to check out a ukulele for the rest of the day, or sometimes the rest of their hospital admission, so they have their own ukulele to keep in the room while they’re still here. They can play it whenever they want and it’s another choice they get to make. And during the weird hours of the night when I’m not there and if they’re awake and in pain, they can help themselves feel better and take their mind off of things for awhile. One particular patient, Kathy, is a 17-year-old who has leukemia. When she was first diagnosed, I happened to have one of my ukulele groups. So she came and really appeared to have fun with all the peer interaction and self-expression and playing the ukulele. Then she got discharged from the hospital and I didn’t see her for awhile. She came back in and she had a pretty bad infection. With our kids who are going through chemotherapy, it lowers their immune system, so they can’t fight off infections like you or I can. So they’re coming down with the common cold and infections that are difficult to kick. She ended up having to go to the intensive care unit (ICU) for a month. While she was up there, she was very weak and very sick but when I went to see her, she told me the first thing she wanted to do when she had the energy was to play the ukulele. As she was finishing up her stay in the ICU I was able to go up and see her and we worked on ukulele a little bit and then she moved to our Comprehensive Inpatient Rehabilitation Unit (CIRU). That’s where our CIRU music therapist, Cori Snyder, was able to use the ukulele with Kathy to help her gain back that strength in her arms and core. The ukulele was such a motivator to get her out of bed and do something active. Even when she was tired, playing the ukulele was something fun to do and it has been a really great expressive outlet and therapeutic tool for her. This narrative was created from a Gather Good interview with Laura Bentz, a board certified and licensed music therapist at the Aflac Cancer and Blood Disorders Center for Children’s Healthcare of Atlanta. Part of her music program is made possible by the generous work of Corey Bergman’s Ukulele Kids Club (UKC). If you are interested in supporting UKC you can donate here and follow them on Facebook, Instagram, and Twitter. If you’d like to make a charitable donation to Children’s Healtchare of Atlanta you can do so here and follow along with the children they serve on Facebook, Instagram, and Twitter.